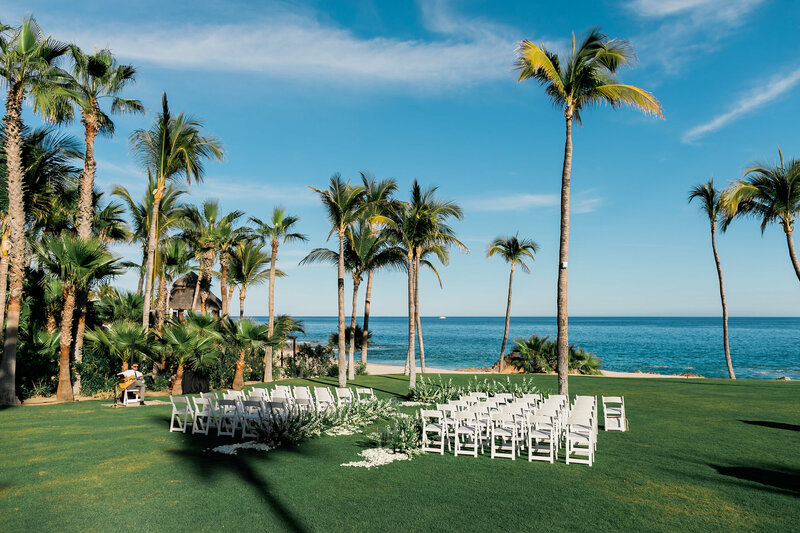 A white wedding at the One & Only Palmilla is every bride’s dream. 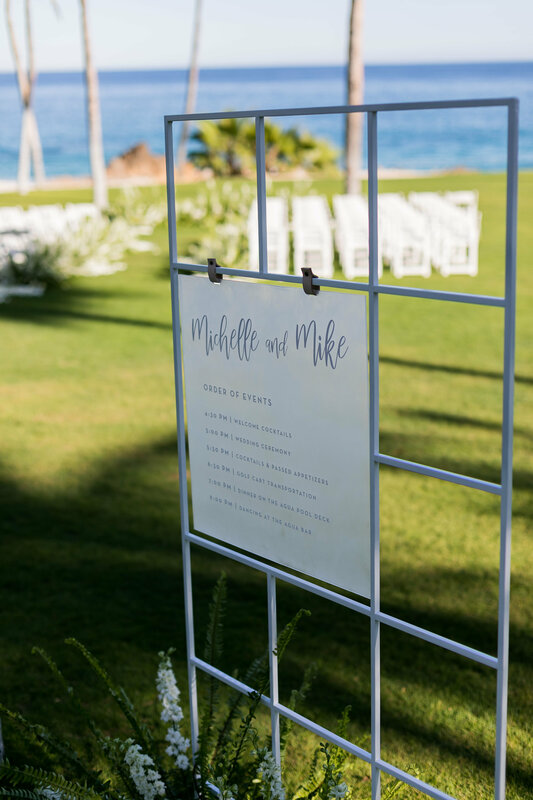 I have been an event planner for several years and I’m still amazed at how our team at Amy Abbott Events collaborates with our bridal couples to create the most beautiful weddings. Michelle and Mike’s wedding the most amazing wedding ever! 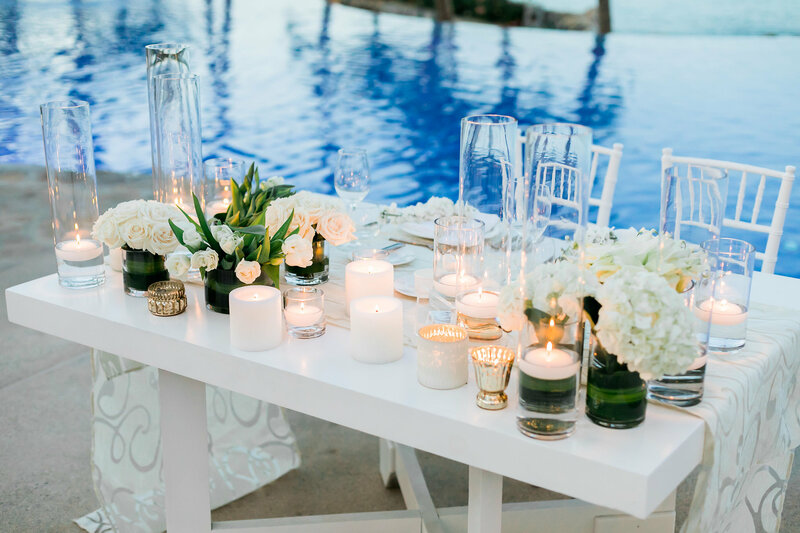 The color white and a desire for an elegant theme were the chosen guidelines; this was a very classic wedding. 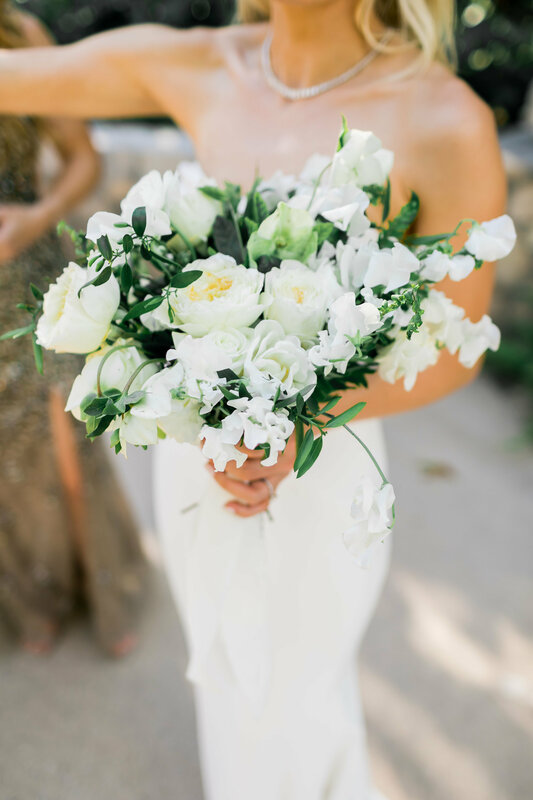 Lola’s Flowers created beautiful white flower arrangements with clear vases. 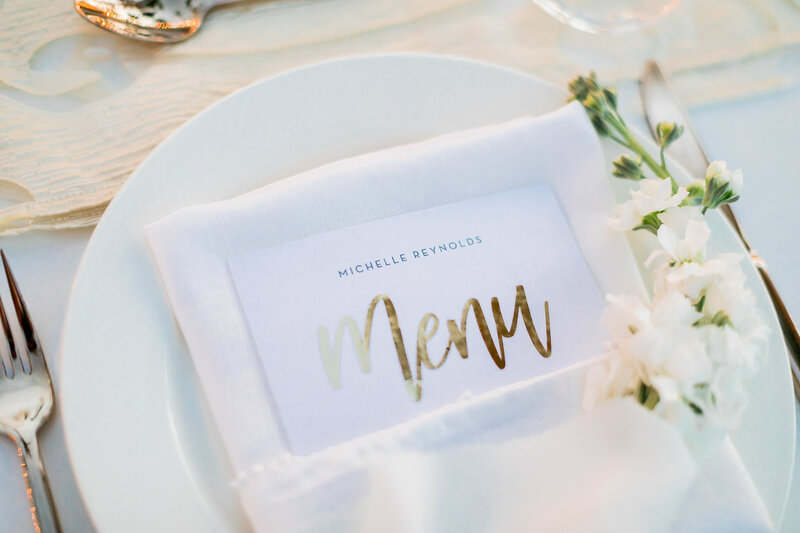 Stunning acrylic table numbers were designed and placed alongside clear charters with gold and pom-pom white napkins and gold flat wear. 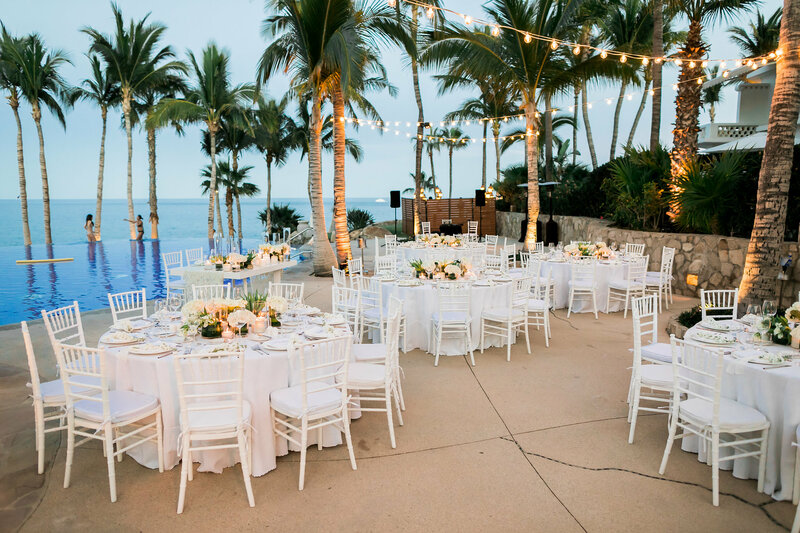 We dressed the tables with classic and elegant shaped body white chairs. Probably the most important feature of the day was the bride & grooms request for an entire wall adorned in white flowers. This type of wedding feature is so dramatic, yet so romantic and was undoubtedly the cornerstone feature of the day. Michelle & Mike’s guests loved the cocktail area that we created. There was a backdrop area between two lounges and two palm trees which were perfectly located for a photo opportunity. 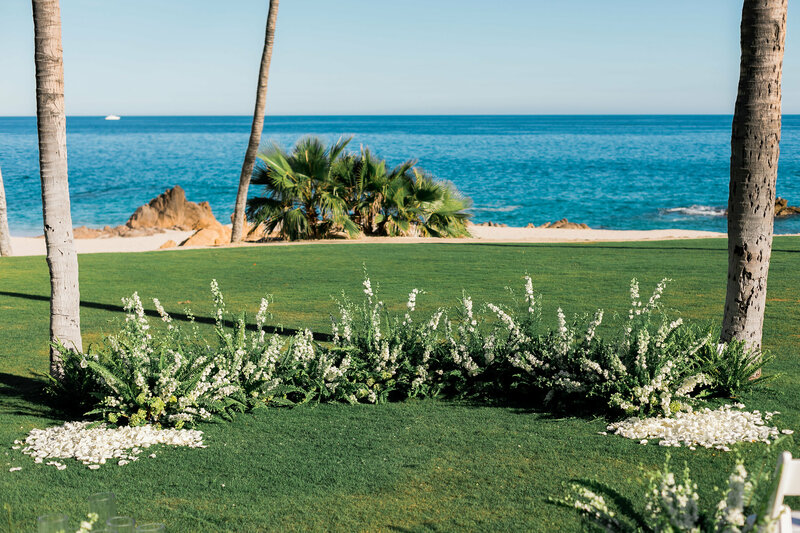 As soon as the wedding guests arrived, they took advantage of this area and took a photo of the beautiful sunset and the flowers. Cocktail hour was a huge success, next came the wedding reception dinner. 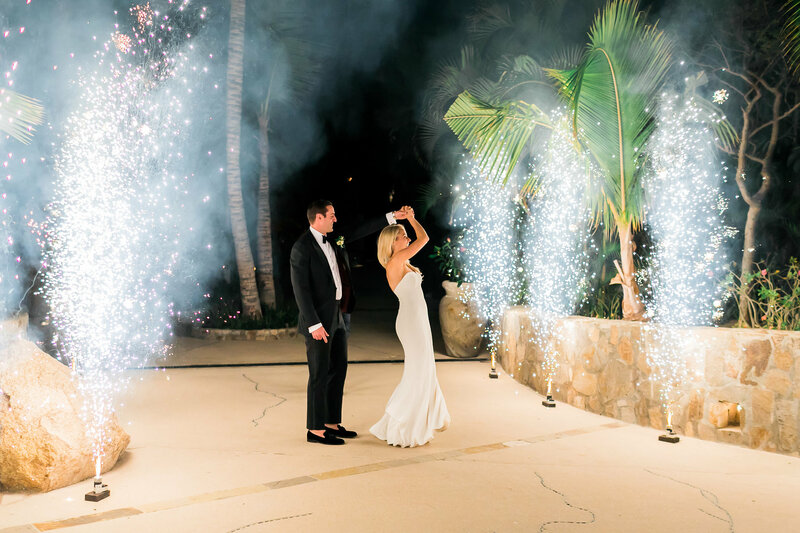 The Wow Factor was in full effect as the couple made their entrance under a spectacular array of fireworks. Wedding guests took photos of the happy couple as they passed under a tunnel of fireworks. The floral wall was moved to the dining area so it also became a great place to take more photos to remember this wonderful day. 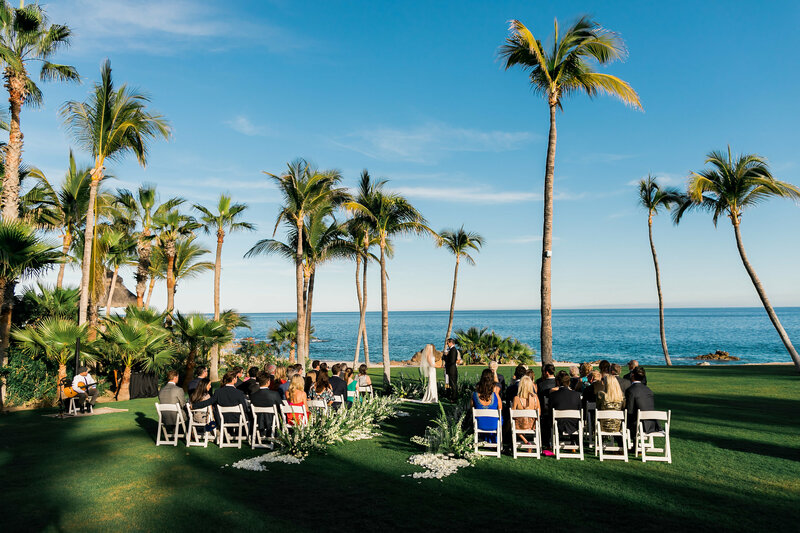 A trio of musicians performed beautifully and after the dinner concluded, guests and the bride & groom danced the night away in a late-night party at One & Only Palmilla’s exclusive bar, Aqua with DJ Alex. This was a fun-filled epic party! Mike & Michelle are such a nice couple and it was a pleasure to work with such a fun and easy-going bride and groom. This wedding was a pleasure to create; I felt like I was working with friends, not just clients. As you can see, Michelle & Mike are a beautiful couple, but inwardly they are beautiful souls also. Everyone enjoyed the heartfelt speeches from various members of their family (Mike’s parents, Michelle’s Dad & Michelle’s sister). Congratulations Mike & Michelle on your marriage! 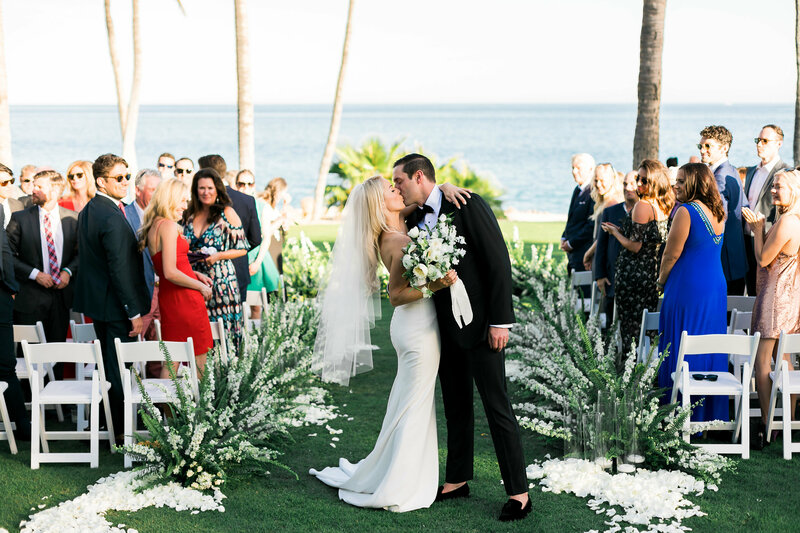 Thank you for giving me the opportunity to create the wedding of your dreams at the One & Only Palmilla. Creating events like yours fills my heart with gratitude and I wish you both a lifetime of love and happiness. 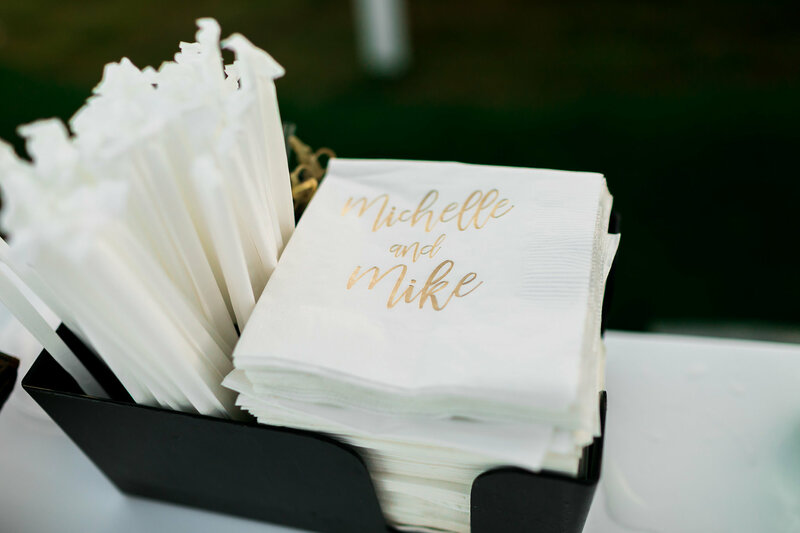 See Michelle & Mike’s full portfolio here.